Here are fun things to do on the Big Island of Hawaii! You can take a submarine ride that plunges 100-feet in the ocean, a helicopter flight which takes you to spectacular waterfalls and flowing lava from several volcanoes or you can go swimming with wild dolphins as well as manta rays. Other incredible options range from an adrenaline filled zipline ride above the tropical canopy to an overnight camping trip to Hawaii Volcanoes National Park to an ATV journey through the jungle. The choices are plentiful for fun from scuba diving to sailing and whale watching to hiking through ancient lava tubes to relaxing at an incredible night of entertainment at one of the many luaus. No matter what adventure you are seeking, the Big Island will please your family. One of the most entertaining and relaxing things to do on the Big Island is to go on a cruise or sailing. You will enjoy the variety of excursions that range from family-friendly to romantic. You can watch the brightly colored underwater world from a glass bottom boat or a luxury yacht or a catamaran. The sights are spectacular from sunsets of pastel colors to beautiful coral reefs with hundreds of brightly colored tropical fish as well as seeing sights from the water like Hulihee Palace, Kamakahonu and the Mokuaikaua Church. while you enjoy a refreshing libation or perhaps a gourmet dinner and there is a lunch option. 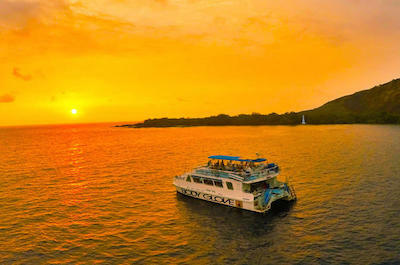 Excursions travel to Kawaihae, Keauhou Bay and Kealakekua Bay. You will listen to interesting commentary from your captain that explains the sights and sounds of Hawaii. Lasting memories will be fulfilled when cruise or sail on the blue waters of the Pacific Ocean. 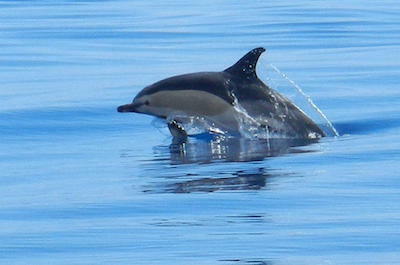 Dolphin and Whale watching is one of the more popular things to do on the Big Island for families who want to learn and watch these intriguing animals in their own natural habitat. You will enjoy a wide selection of excursions from that include a sunset cruise, a submarine ride or perhaps kayaking. You will sail or cruise to interesting places like the Kawainae Harbor, Anaeho'omalu Bay and Kealakekua Bay as well as view these magnificent marine animals in the Hawaiian Islands Humpback Whale National Marine Sanctuary. You can choose your water vessel that ranges from a Willards Navy Seal boat to a luxury or double decked catamaran to a Zodiac raft to a submarine. You will have expert guides explaining how important humpback whales as well as bottlenose and spinner dolphins are to the Hawaiian Islands. An added bonus is seeing the gorgeous tropical scenery from the Pacific Ocean. When you want to experience the true authenticity of Hawaii and Polynesian culture as well as history, the best thing to do on the Big Island is to attend a luau. You will be thrilled with the amount of activities that packed into an evening. You will witness authentic arts and crafts being produced before your eyes, learn how to hula dance and even watch traditional cooking ceremonies. You can relax while taking in the superb scenery at Keauhou Bay and Wai'aha when the sunsets over the horizon. You can choose from a buffet-style to family style servings that feature such Hawaiian and Polynesian favorites as Kalua pork, lomi lomi salmon, poi and mahi mahi. The entertainment portion is sure to please everyone with numerous stories told by stunning hula dancers, fire dancers and authentic music in a highly choreographed setting. 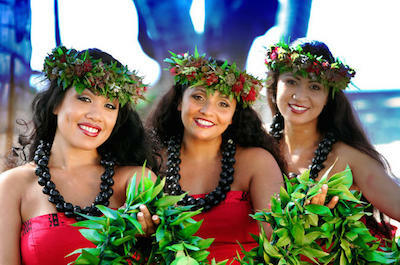 Witnessing a luau in Hawaii is a must thing to do on the Big Island! 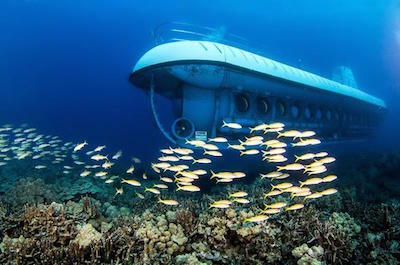 When you want to view the superb underwater world of the Pacific Ocean and don't want to get the family wet, then the ideal thing to do on the Big Island is to take a submarine tour. You will be amazed at the beautiful sites you will see as you submerge 100-feet into the brightly colored coral reefs that are home to hundreds of beautiful tropical fish and marine life. You can view spinner dolphins, sea turtles, manta rays and even reef sharks while you sit comfortably within a state-of-the-art submarine. You expert captain will explain the various sites to you from sea caves to lava formations. You can combine your submarine adventure with several other tours like a spectacular luau or even go snorkeling with wild dolphins. No matter which excursion you choose, your family will be happy when they view the spectacular underwater world of the Pacific Ocean. Snorkeling is one of the most popular things to do on the Big Island for couples, families and singles that enjoy watching the incredible marine life. There are a plethora of excursions to select that range from snorkeling with wild dolphins to viewing manta rays at night to a surreal underwater adventure that includes brightly colored coral reefs. You can visit superb places such as Kealakekua Bay as well as Honaunau Bay while enjoying a splendid day on and in the Pacific Ocean. You will see intriguing lava formations, sea caves and hundreds of tropical fish and the excursions are perfect for people that are novice to expert. You can choose the type of sea vessel you travel on from a kayak to luxury catamaran to a Navy Seal boat. Spend a day being adventurous and we are sure your family will be pleased with the underwater playground of the Pacific Ocean. When you want an underwater adventure that is truly beautiful and packed with interesting marine life, then the perfect thing to do on the Big Island is to go scuba diving. You have a wide variety of locations where you can venture in the Pacific Ocean that are truly unique in the world. You can take a beginners lesson and view a gorgeous coral reef and there are numerous one as well as two-tank dives which are perfect for more advanced scuba divers. You can dive at fabulous places as the Bandit Ledge, Garden Eel Cove, High Rock, Kaloko Arches, Harlequin, South Golden Arches, Turtle Pinnacle and Thunder Reef. No matter which excursion you choose, you are sure to view some of the most brightly colored coral reefs, interesting lava tubes and incredible marine life in the world. If you like new experiences viewing marine life in their natural habitat, then the best thing to do on the Big Island is to go swimming with dolphins. You have a wide variety of options for excursions that include visiting Kealakekua Bay where you will be able to watch these magnificent animals swim. 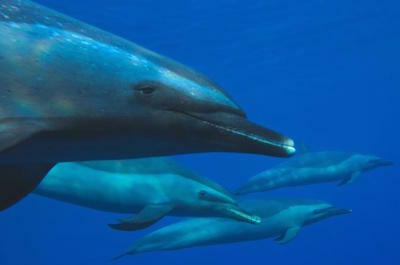 You will watch bottlenose and spinner playing joyfully as they swim around the bay. You can go snorkeling with the hundreds brightly colored tropical fish as you watch the dolphins perform numerous acrobatic maneuvers in the water and in the winter months you might even spot a humpback whale. 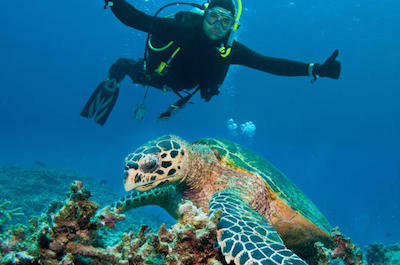 These excursions are very family-friendly and can accommodate all levels of snorkelers from beginners to expert. Most tours include a stop at the Captain Cook Monument and an added bonus is the boat ride where you will have a different vantage point for photographs of the lush tropical environment. 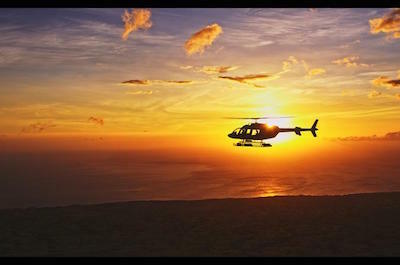 When you want to see as much as possible and experience a thrilling adrenaline rush, then the best thing to do on the Big Island is to go on a helicopter tour. You will be amazed at the vantage points you will have to view some of the world's best scenery and active volcanoes as you soar above the tropical landscape. 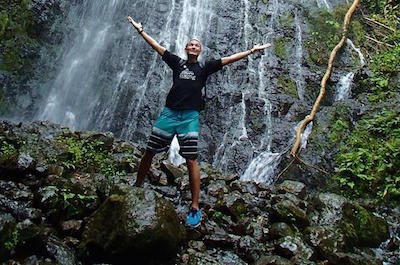 You can fly above the Wailuku River and watch numerous hard to reach waterfalls. You can get a bird's eye view of historic downtown Hilo and the Kohala Coast. Don't forget flying over Hawaii Volcanoes National Park and Mt. Kilauea volcano where you will see lava formations as well as lava flowing into the ocean. You can take a sunset flight or combine your helicopter ride with a zipline and a walking excursion. You can find the perfect memories and shoot the ideal photographs that will last a lifetime. 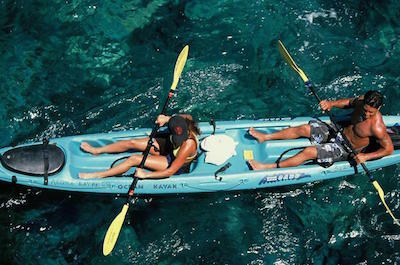 If you want a little exercise while viewing some of the world's best marine life, then the ideal thing to do on the Big Island is to go kayaking. You have a great selection of places and interesting sites to visit while kayaking that include the picturesque Kealakekua Bay where you might spot a humpback whale and a sea turtle or you can search for spinner dolphins as well as go snorkeling amongst the brightly colored tropical fish. Other options include visiting the sea caves along Keauhou Bay, trying out an outrigger canoe to the Captain Cook Monument and you can even go snorkeling at night with manta rays after paddling to a superb viewing location on the Pacific Ocean. When you are ready to explore the beautiful coastline of Kona, paddling a kayak or outrigger is the only way to really feel like you visited the island. When you want to learn something about the history and culture that shaped the Hawaiian Islands, then the best thing to do on the Big Island is to take a historical tour. You have a wide range of selections that will take you on a trip to Pearl Harbor and historic Honolulu City to visiting a coffee plantation that tells a story of ancient Hawaii peoples through petroglyphs and sacred Hawaiian spots. You can take an excursion of Mount Kilauea and Puna Coast on a bicycle and learn the natural history of the island by viewing lava tubes. You can make a stop at Pu'uhonua O Honaunau National Historic Park to view important native cultural sites as well as put your feet on the incredible Punulu'u Black Sand Beach. So whether you are interested in natural or cultural history or the history of Pearl harbor there is a perfect excursion waiting for your family. Day trips are one of the best things to do on the Big Island for first time visitors and families who like a variety of activities and sightseeing opportunities. You will be pleased with the selection that ranges from a trip to Oahu to view Pearl Harbor to visiting waterfalls and Hawaii Volcanoes National Park to driving the island while viewing a coffee plantation, a bee farm and Kealakekua Bay. Other adventurous options have you traveling to Mauna Kea Forest Preserve to view birds, biking on Mt. 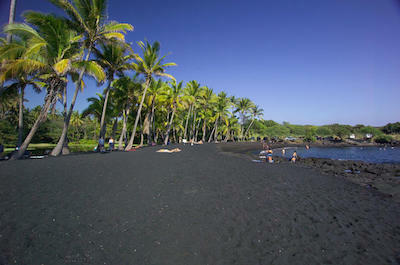 Kilauea and viewing lava tubes as well as visiting several waterfalls including Kohala Falls along the Kona coastline. You can visit Rainbow Falls, take a drive on the historical Banyan Drive and visit Richardson Black Sand Beach for a superb day of learning and fun. Don't forget you can combine such items like a helicopter flight with a tour of the national park for an exciting day. Night tours on Kona have become one of the most intriguing things to do on the Big Island for couples, families and singles. 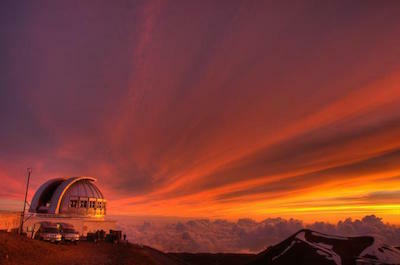 You will be amazed at the variety of excursions that range from star gazing from the summit of Mauna Kea through the world's largest telescope to taking a hike through Hawaii Volcanoes National Park where you will watch the lava glow to eating dinner and enjoying the luminous light of lava at Halemaumau Crater. The sunset is an added bonus as the sky turns from beautiful etched colors to the twinkling of stars. 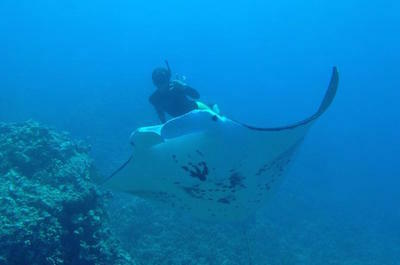 You can even go snorkeling at night and watch beautiful manta rays swim in their natural habitat. Just remember the fun does not end at sunset on Kona and these things to do on the Big Island are a great way for families to spend an evening. One of the more popular things to do on the Big Island is to take an exciting Oahu day trip. Your 14-hour excursion begins when you meet your pilot at the Kona Airport where you will fly 30-minutes and land in Honolulu. As you fly your pilot will give an interesting narrative about the scenery below and your exciting day ahead of you. Once you land you will transported in a comfortable coach and drive to Pearl Harbor. 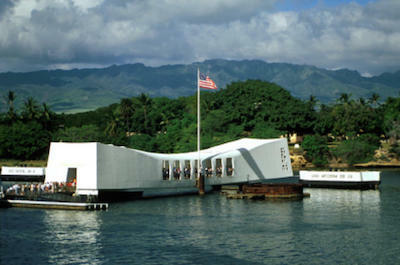 At Pearl Harbor you will board a Navy ferry and cross the harbor to the incredibly moving Arizona Memorial. After listening to a superb narrative from the National Park Service you will then board the U.S.S. Missouri and tour the battleship that is now a museum. Your day is not finished as you board your coach for a drive through of Honolulu City where you will see historic buildings like the Iolani Palace, the King Kamehameha Statue and the Kawaiahao Church. You will pass by the famous Waikiki Beach and drive through the National Cemetery of the Pacific at Punchbowl Crater. Your memorable day concludes with another 30-minute flight back to Kona Airport. When you are ready to hit the road for an exciting day of adventure in Kona, then the best thing to do on the Big Island is to try an ATV and Off-Road Tour. You can enjoy the beautiful scenery of Kona as you cruise on an ATV, in a Jeep or an incredible 6x6 All-Terrain Vehicle. You can visit places like a Kona Coffee farm and venture up the side of Hualalai volcano or you can journey through the lush Waipio Valley where you can swim at the Hiilawe Falls. Other options include off-road driving over ancient lava flows as well as to the top of Mauna Kea where you can look at the stars from the world's largest telescope. Whether you want to visit the jungle or the volcanoes, there is a perfect adventure just waiting for you. If you are interested in getting outdoors and experiencing the real Kona, then the best thing to do on the Big Island is to on a hiking and camping tour. You will be amazed at the variety of places you can visit such as the Waipio Valley, Hawaii Volcanoes National Park and the Hamakua Coast. Other exciting adventures will take you to Akaka Falls, Rainbow Falls and Hiilawe Falls where you can take a swim after a short or exhausting hike. You can decide to camp overnight within the national park and include snorkeling or kayaking with journey. You can watch flowing lava on a hike to Mt. 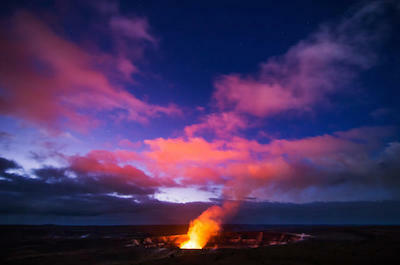 Kilauea or add an exciting helicopter flight or watch a beautiful sunrise while hiking through this tropical paradise. There are hikes for novices as well as experts that will leave you awe inspired for your next exploration. 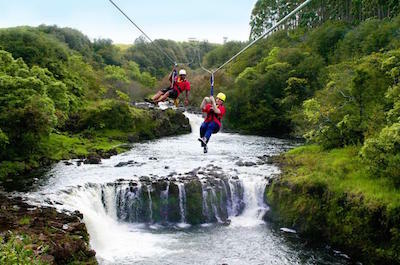 Zipline tours are one of the best things to do on the Big Island when you want family fun that is mixed with pure adrenaline. You will be pleased by the selection of excursions you can choose from that include gliding on a variety of ziplines that range in length from 500-feet to 2,400-feet to 3,350-feet in length. You will soar above the tropical forest canopy and view incredible scenery below like the Umauma Falls, Kamaee Falls and the Kolekole Falls as well as watch the tropical wildlife. You will walk over 200-feet high suspension bridges or you can simply walk the tropical landscape while your family glides above. Added bonus on these excursions is combining the activity with a ride through Hawaii Volcanoes National Park or a helicopter flight or your favorite watersport adventure like kayaking which will make for a full day of fun and memories. When you are ready to lift into the blue skies of Hawaii and view the gorgeous scenery below, then the perfect thing to do on the Big Island is to take an airplane tour. Your flight experience will be wonderful with a little adrenaline threw in as you lift off. You will fly above spectacular scenery such as the Hawaii Volcanoes National Park where you will view from above the unbelievable flows of lava and unique lava formations. You will soar high in the sky as you watch cascading waters down some the nicest waterfalls on Kona. The Pacific Ocean will have you in awe with the different shades of blue etched in your mind and when the sunset begins you can watch the skies turn into a canvas of pastel colors. When you land you will have memories for lifetime as well as photographs of this beautiful tropical paradise. If you want to turn your lunch or dinner into lifetime memories, then a great thing to do on the Big Island is to try a dining experience package. You can enjoy a wide range of activities and attractions before or after you dine on some of the island's best cuisine. You have options to visit places such as Mauna Kea State Park where you can view the Mauna Kea and the Mauna Loa volcanoes. You can travel to Kilauea National Park and indulge in an extensive dinner at the Kilauea Lodge. Other options have you submerging 100-feet in the Pacific Ocean where you will view the bright corals, lava tubes and tropical fish of Kona. Later you will experience a wonderful luau which is packed with hula dancers, story tellers and great authentic music as well as specialty dishes of the Polynesian islands like Kalua pig. 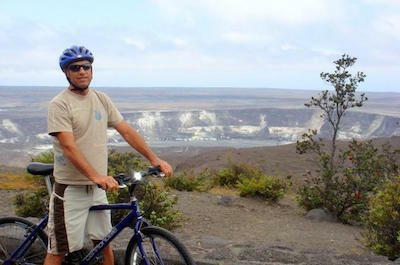 When you want some exercise while viewing the incredible scenery of Kona, then the perfect thing to do on the Big Island is to take a biking tour. 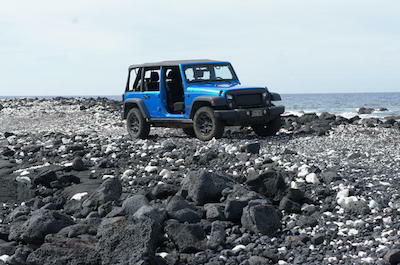 You can choose from a ride range of excursions that include a ride through a 100-acre private ranch near Waimea which includes big views of the Kohala Mountains or cycle through Hawaii Volcanoes National Park where you can view the Kilauea volcano, Jagger Museum and the Thurston Lava Tube. Other options include a full-day excursion near Hilo that takes you through the park to view the volcanoes on the Chain of Craters Road before setting out to the Puna Coast where you can relax on the black sand Kaimu Beach. Most tours include lunch or beverages and all tours include the necessary equipment. You will be pleased with your choice of great things to do on the Big Island which is sure to be full of lasting memories. When you are ready to get out on the blue Pacific Ocean for adventure and fun, then the ideal thing to do on the Big Island is to take a fishing trip. 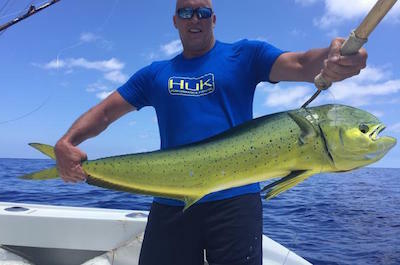 Your guided excursion is ideal for singles, families and couples who like to spend time on the water while fishing for trophy fish like marlin and tuna. You have a wide variety of choices from four to six to eight hours and you can select what size of group you want to interact with while on your trip. You will learn all the new fishing techniques from your expert captain and crew while you try to land that whooper of a fish. Most trips include food as well as beverages and all excursions include the necessary equipment. An added bonus is the incredible view of the coastline from a different vantage point as you cruise the Pacific Ocean. When you want to get out into nature and view some of the more incredible sites on Kona but don't want to hike, then you should take a Segway tour. These excursions are ideal for everyone including families and most last only a half-day leaving you time to explore or relax on the beach. 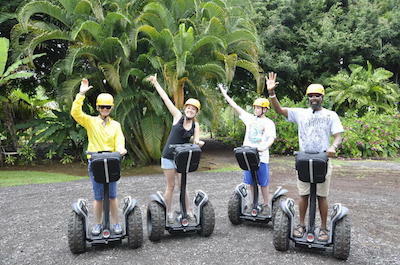 If you are a novice you should try a beginner's lesson which gives the basics of navigating your Segway as well as seeing Mauna Kea volcano. You can choose an easy to moderate ride at Mala Pua or glide the Hamakua coastline; a more challenging cruise at the Botanical Gardens where you will also watch the tumbling waters at Kamaee Falls and the beautiful landscape around Hanapueo Stream. All of your equipment is included and you will receive safety tips from your guide as well as interesting information as you cruise along on Segway. 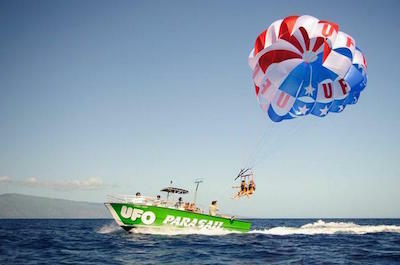 If you are searching for a quick adrenaline rush and fantastic views of the Kona Coast, then the perfect thing to do in the Big Island is to go parasailing. 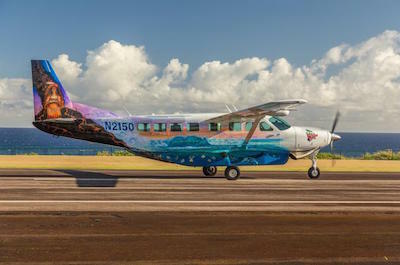 This attraction is ideal for couples, families and singles because you can choose if you want one to three people to soar through the blue skies of Hawaii. You will have a choice of going 800 or 1,200-feet in the air before you lift off from your boat. The great thing about parasailing is the view from above where you will watch volcanoes, the tropical landscape and the incredible coral reefs while you are flying high above. An added bonus is the fun of a boat ride which might have spinner dolphins or sea turtles following you while you wait your turn. These things to do on the Big Island are quick and are a perfect fill-in idea while you are relaxing on the beach. If you have ever wanted to learn how to surf and carve on the big waves, then the best thing to do on the Big Island is to take a surf lesson. You will be thrilled with the personal attention you will receive from your certified surfing instructor. Most lessons are small groups between four to six people so that your instructor has between two or three students per session. You can also choose to take a private lesson that will give you the personalized instruction you are seeking. Excursions are two hours and take place in Kahalu'u Bay which is located on the western shoreline of the island. If you want a perfect half-day excursion of watersports then add a standup paddleboard lesson. All of the equipment is included in your tour and these water things to do on the Big Island are perfect for beginners to more skilled surfers who are seeking to hone their skills.